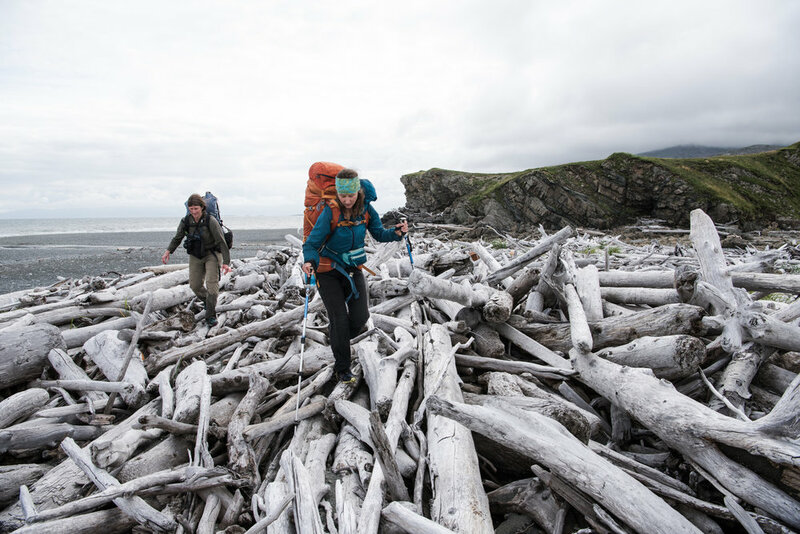 To get a better understanding of what is at stake when it comes to the proposed Pebble Mine, this August I struck out into the wet, windy, wild country of western Cook Inlet with two other Alaskan women adventurers, writer Erin McKittrick and visual storyteller Jayme Dittmar. We walked from Pebble’s proposed marine industrial complex, along the transportation corridor Pebble hopes to build, all the way to the shores of Iliamna Lake. All together, it was a 50-mile ground-truthing expedition. During our four-day journey we encountered harsh weather, culturally significant sites, dozens of salmon streams and other evidence that the route Pebble has proposed to the Army Corps of Engineers is both poorly chosen and poorly researched. Pebble’s proposed road corridor traverses State of Alaska land through the Kamishak Gap, a low point in the Aleutian Range, which creates what we found to be a wind tunnel from the notoriously rough water of Amakededori Bay to Alaska Peninsula Corporation-owned land on the shores of Iliamna Lake. It’s a route that crosses nearly 200 streams, almost half of which have salmon or anadromous fish. The interconnectedness of the meandering streams and lakes dotted throughout the tundra and granite was incredible and revealed the fragility of the ecosystem; we know from decades of research in Bristol Bay that salmon rely heavily on these sorts of small headwater streams for rearing. The cumulative impacts of 35 trucks hauling mining concentrate and diesel several times per day, possible spills, dust on tundra, and frequent noise would certainly impact the myriad of water flowing in every direction. The road would bisect movement of animals between Lake Clark National Park, Katmai National Park and Mc Neil River Game Sanctuary and Refuge. As we stepped over stream after stream it was shocking to consider, at a visceral level, the scale of impact. The whole Pebble Mine proposal is spread out over a huge chunk of our state — not just Bristol Bay, but all the way over the mountains to Cook Inlet. Erin McKittrick has a keen sense of this scale; she has hiked nearly every watershed impacted by Pebble. In 2006 she completed a 440-mile trip from the proposed mine at the headwaters of Bristol Bay to Dillingham, 220 miles downstream along the Nushagak watershed, and then back upriver along the Kvichak. Combined, this has left her with a prevailing impression of the massive footprint Pebble would create. There is very little scientific understanding and baseline information about the corridor, potential impacts to the fish, wildlife, and people that use the area. To get a good sense of the human history and cultural significance I talked to many local people before departing on this expedition. I learned that Amakdedori is an important cultural site to the people of Bristol Bay. This was reinforced by many people that we talked to in Kokhanok, a beautiful village on the southern shore of Iliamna Lake, where our trip ended. Many families used to walk from the lake to Amakdedori to fish and collect clams early in the spring before the fish arrived to the streams around Iliamna Lake. People were busy hunting caribou, smoking fish and gathering berries when we arrived in Kokhanok. It made me wonder how a road, ferry terminal, daily boat traffic of Pebble’s proposed ice-breaking ferry across the monstrous lake, and influx of workers might impact this community. As we departed the float plane at Chenik Lake and turned our backs to the wind, heading north to Amakdedori, we hopped across Amakedroi Creek, barely able to cross without stepping on salmon swimming upstream. We saw nine-foot adult and cub bear prints scattered along the sandy beach and salmon heads littered about. It drove home the fact that this industrial complex will certainly impact brown bears. World-famous McNeil River State Game Sanctuary and Refuge, located just over an eighth of a mile (0.13 miles at its closest point) from the proposed road, is home to the largest congregation of brown bears in the world. Bear viewing brings hundreds of thousands of dollars into the local economy of Homer, the nearest town. A massive industrial complex would certainly disrupt this incredible wildlife ecosystem as well as sustainable economic niche. 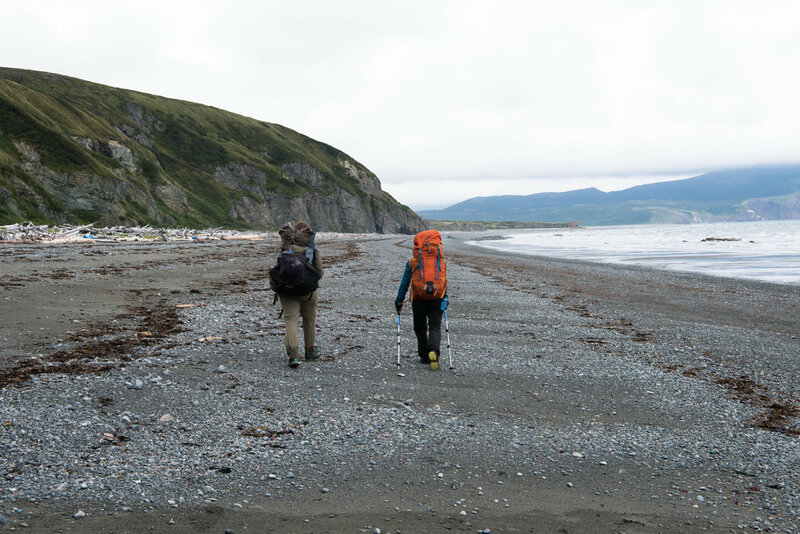 Katmai National Park is a stone’s throw to the south and Lake Clark is just to the north. One has to wonder how the proposed mine and transportation route would affect these adjacent wild lands and the communities around Iliamna Lake and their ability to continue to have access to an abundance of plants and animals that support a vibrant subsistence way of life. As we bushwhacked, pushed our small bodies into the 50 mile per hour winds, and stopped periodically to take measurements of the many fish-bearing streams, it occurred to me that if we are not vigilant and persistent, this could be the umbilical cord, or gateway, to the Bristol Bay mining district. A massive industrial port complex at Amakdedori is lunacy enough, but walking the Kamishak Gap past evidence of moose, caribou, wolf, and massive brown bear tracks really drove home for me the scale of impact a road through this corridor will have. 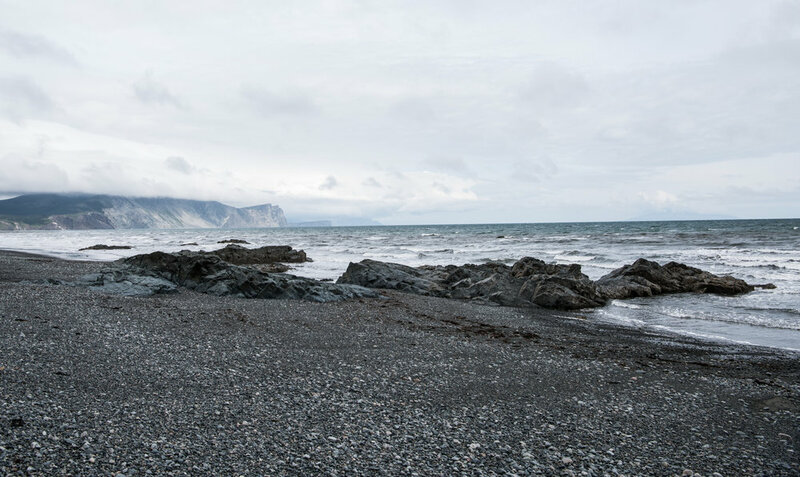 It will open the door not just to a unique corner of Cook Inlet, but to a massive mining district that will impact a huge swath of southwest Alaska. The routes proposed by Pebble can be viewed here.